The HealthUnlocked Health blogger Awards will close on Friday 1 September. Everyday we see first hand how important sharing information and experiences can be. It is always inspiring to hear that HealthUnlocked has supported a user on their health journey, whether this is through reducing feelings of loneliness and isolation, or by enabling a user to access information and guidance that they, otherwise, may not have been exposed to. Many of our users also turn to people and bloggers off the HealthUnlocked site with the same or similar condition to them. This is why we launched these awards, to highlight the role bloggers have in raising awareness and encouraging users to better understand their health or what they are going through. These awards recognise individuals who use their own experiences to advise others how to manage their symptoms and improve their overall well-being. For an individual who is newly diagnosed or has experienced the effects of a condition for a long time, following a blogger can provide support in other areas of life that may not given from a medical professional such as; relationship and financial advice. It can also offer reassurance and solidarity for an individual to follow updates of someone in a similar situation to them, with feelings and thoughts they can relate to. 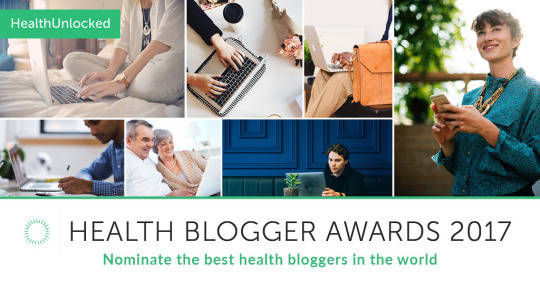 The Health Bloggers Award is proving to be a really exciting time for HealthUnlocked, we have had so many great, honest accounts and inspirational bloggers nominated on so many conditions, or general health and wellbeing topics. We will be reaching out to these bloggers to tell them about each nomination and the HealthUnlocked communities that so many of our users turn to. We have also had nominations for some of the people within the platform that post, and it is wonderful to see the support and help that our users give to other users. Unfortunately they do not meet the criteria for the awards (people must also blog on a different website) but we’ll be looking to run some awards in the next year that recognise these people and the difference they make to all of you. In September we will be launching a public vote for the bloggers shortlisted in the Health Blogger Awards. This will be your chance to vote for your favourite blogger in each of the awards. We will share more information on this soon. Next Entry Fibromyalgia is an invisible illness and it’s more common than you may think!